Research is one of my personal favorite aspects of my career. The aspect of coming up with a project, collaborating with fellow authors with similar interests, and submitting an article is a joy. The following are several articles I have written thus far as I start my path in academia, along with publications in different printed media. Hanrahan C, Aungst TD, Cole S. Evaluating Mobile Medical Applicaitons. Bethesda, MD: American Society of Health-System Pharmacists, Inc.; 2014. Synopsis: This was an invited piece by Conor who had been invited by ASHP to construct a guide for their new E-Report series on how to review mobile medical applications. This coincided with out independently developed presentations based on reviewing medical applications. Whereas mine was developed for faculty to work in conjunction with students and presented at AACP, Conor had developed his for clinicians and gave it at ACCP. Sabrina was a key author in her background in drug informatics and evaluating resources. This e-book is the culmination of our experiences in reviewing apps and the literature on mobile medical applications centered on primarily clinical and drug references, aimed at guiding pharmacists. My primary work centered on the introduction, application to pharmacy, and figure/table development. Miranda AC, Serag-Bolos ES, Aungst TD, et al. A Mobile Health Technology Workshop to Evaluate Available Technologies and their Potential Use in Pharmacy Practice. BMJ Stel 2016;2:23-26. Synopsis: This report was based off the experiences of the faculty in Florida that I collaborated with to bring digital health devices into their physical/clinical assessment classroom and workshops. Essentially, we created scenarios where students could test and practice with digital health tools such as Withings Blood Pressure Cuffs and Scales, and AliveCor. I am passionate about this, as I feel it is one of the few classes currently demonstrating this technology to students, especially in the realm of pharmacy. My hope is to help spread this further, especially if pharmacists will end up selling such devices in their pharmacy in the near future. Aungst TD, Miranda AC, Serag-bolos ES. How mobile devices are changing pharmacy practice. Am J Health Syst Pharm. 2015;72(6):494-500. Synopsis: This paper was the result of a collaboration brought about due to a previous publication. One of my colleague's past residents contacted her regarding a paper she saw of mine, and based on her interests in mHealth and mobile, we ended up exploring a potential paper on our shared interest in digital health and the use of mobile technology in pharmacy. That being the case, I found this my first paper written in conjunction as an academic with colleagues from another school. It was a fun experience. Overall, it taught me that things definitely move slower when doing this type of work versus being able to meet or have previous connections and knowledge of each other. I also found the reviewers for this paper comments quite interesting and really helped make great critical recommendations to help make this paper more applicable to a larger reader base. Evans P, Aungst TD, Massey C, Bartlett D. Expanding clinical and information services to the ambulatory older adult through community outreach programs. Consult Pharm. 2015;30(1):31-7. Synopsis: This was a fun piece to write, which helped summarize alot of the activities that the organization that sponsored my fellowship conducted. Most of these were really different outreach programs that spanned multiple venues with older adults in central Massachusetts, ranging from low-vision screenings, medication management, support groups, to teaching older adults how to use a computer to search for health information (using NLM MedlinePlus). I think writing this piece helped me understand that writing can go beyond medical research and expand to even actions in that an organization conducts. However, one thing I think looking to the future that would really have made this better would be more objective data or outcomes to report. As it stands, it demonstrates what can be done and how to accomplish it, but now what comes about. Aungst TD. Integrating mHealth and mobile technology into the pharmacy curriculum. Am J Pharm Educ. 2014 Feb 14;78(1):S19. Synopsis: There has been a substantial growth in mobile technology within the past few years that may have significant implications for the practice of pharmacy. In order not to fall behind, the pharmacy curriculum may need to adapt to the changing modalities of healthcare delivery to keep our future students and practitioners abreast of the changing face of medicine and create overall competent pharmacists that may function well with other healthcare providers and patients. Co-Authors: Kevin Clauson, PharmD; Satish Misra, MD; Thomas Lewis, BSc; Iltifat Husain, MD. Aungst TD, Clauson KA, Misra S, Lewis TL, et al. How to identify, assess and utilise mobile medical applications in clinical practice. Int J Clin Pract. 2014;68(2):155-62. Synopsis: This was an invited piece by the editor Dr. Leslie Citrome, who also wrote an accompanying editorial. The article serves as a 'How to...' guide for medical professionals looking to use their mobile devices as an adjunctive clinical tool in practice. While introductory, it may be beneficial for other early adopters looking to reinsure their current practice. Co-Authors: Satish Misra, MD; Thomas Lewis, BSc. Misra S, Lewis TL, Aungst TD. 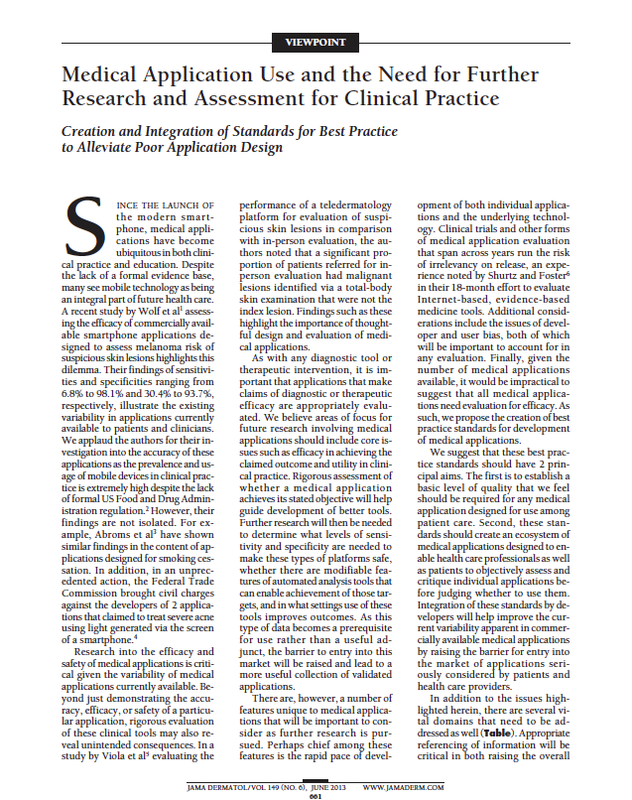 Medical application use and the need for further research and assessment for clinical practice: creation and integration of standards for best practice to alleviate poor application design. JAMA Dermatol. 2013;149(6):661-2. Synopsis: This article was a response to the defaming article by Wolf and colleagues that evaluated dermatological apps that could 'identify' skin lesions at risk for melanoma. Unsurprisingly, the results were damning in that there was a broad range of specificity and sensitivity found amongst the four apps evaluated. Nonetheless, it supported the running concern amongst those at iMedicalApps about the poor overall design of a multitude of medical apps, and the risk they posed when passing from a simple medical reference to diagnostic tool. Synopsis: This was the first paper I wrote on my own (with a lot of help from fellow academic faculty which I am immensely thankful for) that I feel has launched my interest in mobile applications and associated mobile technology in pharmacy practice. The review identifies mobile applications that may be beneficial for medical and drug related references on the go, and associated applications related to productivity. One thing that struck me when writing the piece was the substantial amount of poor quality apps available on the online stores at the time. Co-Authors: Scott Bolesta, PharmD, BCPS; Fanhui Kong, PhD. 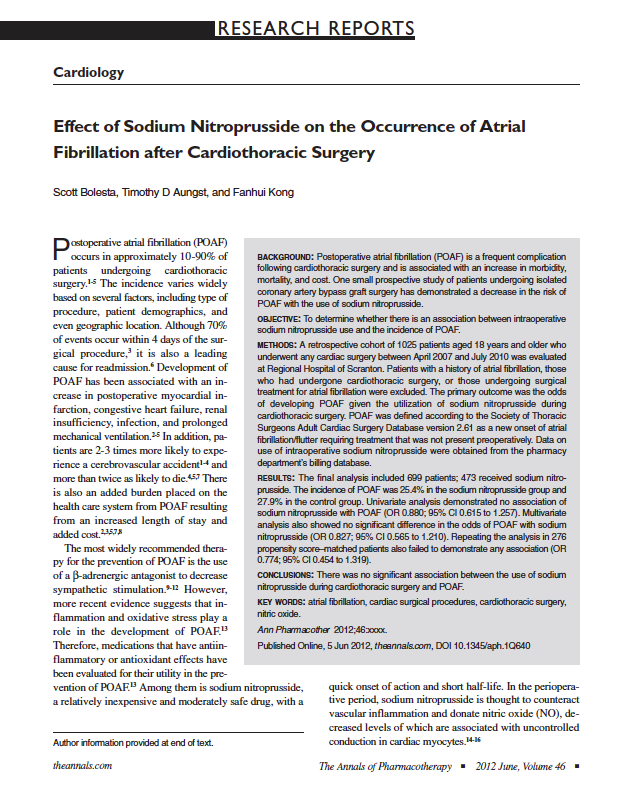 Bolesta S, Aungst TD, Kong F. Effect of sodium nitroprusside on the occurrence of atrial fibrillation after cardiothoracic surgery. Ann Pharmacother. 2012;46(6):785-92. Synopsis: This was my first publication that was started in my last year of pharmacy school and finished during residency. I owe a large part of my current love for writing due to the precepting of my professor Dr. Scott Bolesta who oversaw the project and guided me in the study design, data collection, and writing. It also allowed multiple sojourns into poster development and abstract writing which I feel paved the way for a great experience to the area of scholarship that receives much denounced love for many in academia I feel, thus making me much of an oddball at times. The article was based upon a pilot study conducted earlier, which our results did not concurrently agree with. However, say what you will about a retrospective cohort design and its weaknesses, it is a good way to start in research. But damn the methods of conducting a retrospective propensity score analysis. Was not my favorite part I will admit. Synopsis: The National Community Pharmacists Association (NCPA) and the American Association of Colleges of Pharmacy (AACP) partnered together to create an educators toolkit to address the growing problem of medication non-adherence (a multibillion dollar issue) in order to help future pharmacist to detect, monitor, and help improve medication adherence amongst their patients. One aspect of the toolkit is mock scenarios where students practice being patients taking medications on a daily basis. I did this in pharmacy school with the so called 'Jelly Bean Challenge' where students were to take their dispense medications (Jelly beans) on a daily basis, track their adherence, and reflect on the overall experience. I myself got jibed whereby I only got an inhaler and non of the tasty jelly beans sadly. 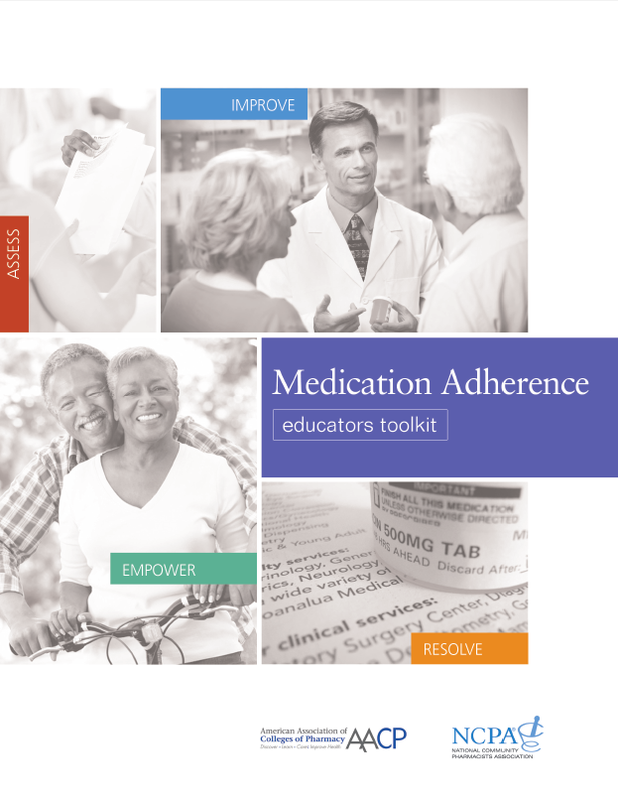 In this toolkit I helped with the implementation of online tools and apps to help teach students to track their medications using everyday smartphones.